Melanie's Closet Project Blog: I love the Swiffer Cover, so here it is in use. 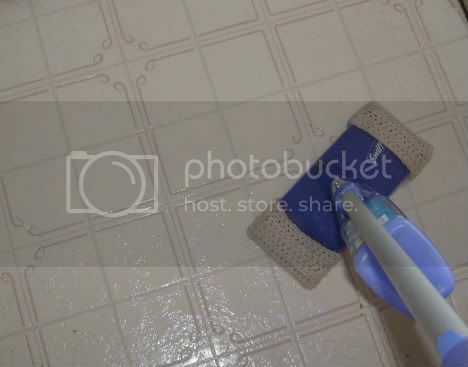 Yup, I'm gonna show you pictures of my used mop and dirty floor. Aren't you thrilled? Sorry about the looks, it has been used to death since I made it because my kids keep fighting over it. Oh, and I can't forget the coffee-grounds-on-my kitchen-floor incident. Pick up the grounds FIRST, then mop! Sheesh, He's 6 already, do I have to tell him EVERYTHING? This is the linoleum on the floor just inside my back door. three kids, a husband, two dogs and this is a regular look for us. 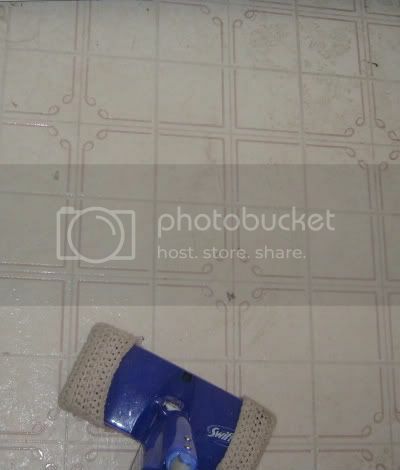 And below is the same spot of floor just after using the Swiffer cover. It took some real scrubbing, but the cover can take it since it's cotton, not paper. I love it! The stupid swiffer is the one throw away thing I can't seem to get over... so now I want the covers you are making!!!! I'm addicted to your stuff.